NMAT 2016 Registration Online Application Form: Narsee Monjee Institute of Management Studies (NMIMS) is going to conduct the National Management Aptitude Test (NMAT) on the behalf of the Graduate Management Admission Council (GMAC). Interested aspirants are advised to apply for this entrance exam before the last date of the NMAT Application Form 2016 submission. Applicants should read the complete procedure about how to apply for the NMAT 2016 Online Registration process. This year on wards, there is NO Management Quota at NMIMS for admission to the post graduate degree programmes such as MBA / PGDM / PGDBM. Candidates seeking admission to the management courses should undergo the NMAT 2016 Entrance Exam. The candidates those who are successfully cleared the GMAT Exam 2016 means, they can get their requires seats in NMIMS. All the procedure relates to NMAT 2016 Registration process is available below for your reference. If you needs any information related to the NMAT Online Registration Form, then you can leave a comment below. Aspirants can apply for more than one Programme and more than one campus. They are having seven choices to select the required program in required Institution. 1. Test Name: NMAT 2016 by GMAC Exam. Rs.1100/- for either MBA Full Time, Mumbai or PGDM, Bangalore Campus. Rs.1500/- for MBA Full Time, Mumbai or PGDM, Bangalore Campus. NOTE: Same Fee for Re-Application. 4. NMAT 2016 Eligibility Criteria: Candidates should possesses Bachelor Degree in recognized university with 50% marks. 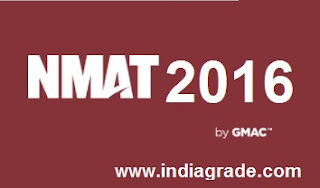 NMAT 2016 by GMAC Exam is a mandatory requirement for applying to NMIMS University programmes. First register into the website by using your personal details such as E-mail, Name, Mobile Number and enter new password. Then login into the website to start filling the Online NMAT 2016 Registration process. Candidates must follow the rules and regulation to applying for the NMAT 2016 Exam. Candidate has to complete the application process by completion of fees payment process on the NMIMS (Deemed University) website.